Cristina Fernandez is recovering after having surgery to remove a cancerous thyroid gland, and is cautiously expected to make a full recovery. 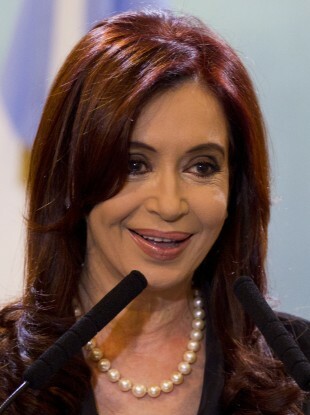 ARGENTINA’S PRESIDENT was awake and recovering today after a 3.5 hour operation to remove a cancerous thyroid gland. Cristina Fernandez’s surgery went without complications and all her vital signs were good, her spokesman Alfredo Scoccimarro announced, prompting cheers and applause from supporters gathered outside the hospital. Doctors had expected a routine surgery and predicted a complete cure without chemotherapy, since preoperative tests showed the cancer had not spread beyond a nodule on the right side of her thyroid gland. Vice President Amado Boudou was put in charge shortly before the operation, and will remain as the country’s constitutional leader for 20 more days while Fernandez takes medical leave, the presidency said. Fernandez, 58, was found to have papillary thyroid carcinoma shortly after beginning her second four-year term as Argentina’s leader last month, her doctors said. The surgery at Hospital Austral in suburban Pilar, north of the capital, was led by Dr Pedro Saco, a veteran Argentine oncologist who specialises in cancers of the head and neck. Experts say thyroid removals are about as routine as cancer surgeries can be, although the process is not without risk: surgeons must take care not to damage a nearby nerve that guides the vocal cords, or to remove the adjacent parathyroids, which regulate the body’s calcium supply. Patients should generally take care to relax their necks after surgery. Temporary hoarseness is common, and in rare cases, permanent voice changes can result. Patients also must swallow radioactive iodide for several days to destroy any cancerous remnants and provide for clearer images to detect any additional cancer, according to the US National Institutes of Health. After surgery, patients take medicine — levothyroxine sodium — for the rest of their lives to replace a hormone that the thyroid glands produce. Blood tests every six to 12 months to measure thyroid levels also are recommended. Most thyroid specialists agree that removing the entire gland is the best course, according to Dr Jennifer Ogilvie, an assistant professor of surgery at New York University who has performed about 1,500 similar operations. Fernandez’s doctors said the tumor had not metastasised or spread beyond the nodule, but Ogilvie said there is no way to know before surgery whether microscopic bits of the cancer have developed elsewhere in the gland. Also, when the entire thyroid is removed, levels of a protein called thyroglobulin should drop to zero, and simple blood tests thereafter can show whether cancer cells that also produce the protein have reappeared. And while the plan is for her to remain hospitalised for up to 72 hours, most patients recover quite quickly. Fernandez is only the latest sitting South American leader to be diagnosed with cancer. Presidents Fernando Lugo of Paraguay, Hugo Chavez of Venezuela and Dilma Rousseff of Brazil all have undergone treatments recently. Supporters waiting anxiously outside the hospital waved flags, carried handmade signs that said “Be Strong Cristina” and built small shrines to the populist leader, who won re-election with a 54 per cent landslide in October. Many carried pictures showing Fernandez and her late husband, former President Nestor Kirchner, who died of a heart attack in 2010. Boudou, her former economy minister, is expected to work closely with Fernandez’s other Cabinet members while she recuperates at her home in Calafate, in far-southern Argentina, and make no major policy changes. Argentina all but shuts down anyway for the summer holidays in January and February, so her diagnosis and surgery came at a relatively calm time. Email “Argentine president recovering after cancer surgery ”. Feedback on “Argentine president recovering after cancer surgery ”.